Streaming Devices: Apple TV Review « Get Rid Of Cable | Cut The Cord And Get Rid Of Cable Today! Starting with the Apple II, continuing on to the iPod, and progressing to the iPhone Apple has been the leader in creating revolutionary technology for decades. Now they are continuing this trend with the Apple TV streaming media player. This device brings the same features we have come to expect from Apple for decades. 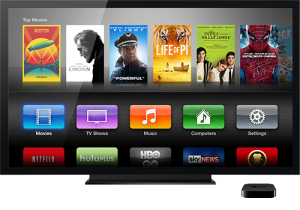 The Apple TV provides access to most of the top media apps available like Netflix, Hulu, and YouTube. Combine that with the way Apple TV seamlessly integrates with iTunes allowing you play all of your downloaded music and video through your television, as well as integrate it with all of the other Apple devices in your Apple ecosystem. These features make one of the alternatives to cable TV: Apple TV worth considering for anyone that has decided to get rid of cable. The selection of channels on Apple TV is pretty decent hitting most of the major ones like Netflix, Hulu+, HBO Go, and WWE Network. Additionally you can download and watch or listen to anything available on the iTunes store as well as your personal iTunes library. The interface is extremely easy to read and navigate so it won’t be difficult to find what you are looking for. Apple TV can also quickly use home sharing in order to connect to your MAC/iPhone/iPod Touch and playback the video with AirPlay technology. The software also includes reliable iCloud support, which can allow you to look into all of your photos through the Photo Stream. You can also stream music from the iCloud with your iTunes subscription, and a personalization feature can allow you to use one of your photographs as the screensaver for the device. 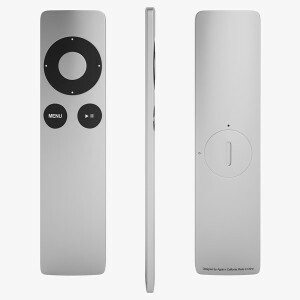 Apple TV provides you with the quality you have come to expect from Apple products but it is not without its flaws. The Apple TV misses a few channels and services that some people may want. Channels like Amazon Prime and Pandora Radio are pretty glaring omissions that are motivated by business rather than user experience. Furthermore, unlike Roku 3 you can’t add any channels other than those Apple provides the device making its customization options virtually non-existent; essentially it is Apple’s way or the highway. Some people like the slim remote control but I found that it is so small and thin that it is difficult to manipulate and easy to lose. It also doesn’t have a clear home button so for a long time I thought you had to press the menu button several times in order to get back to the main menu; it was only by accident that I ended up discovering that holding down the menu button would end up taking you back to the home screen. This was probably in the instruction manual, but who reads those? With my Apple TV I found that it was just generally unreliable. I will be watching a program and it will randomly just go back to the main menu. No error, no warning or freezing just one minute in the middle of an episode of True Blood the next minute the main menu, which is already frustrating but even more so when you realize it has no recollection of where you were and you have to fast forward to pick up where you left off. Playback in general is just not very smooth and it seems like it has a weak WiFi receiver as it will constantly pause to buffer or freeze and say it cannot play the currently selected product. The Roku 3 in the same place, in the same room, playing the same content did not have these issues, and a Google search shows that it is a very common complaint with no solutions other than “Reboot the device” or “Upgrade the firmware”. If you are someone that owns numerous Apple devices and are committed to the Apple ecosystem Apple TV will easily integrate with everything else. With Airplay, iTunes, and home sharing you will have more than enough access to all of your Apple device content and if that is what is important to you then you will probably enjoy the Apple TV as an alternative to cable TV. 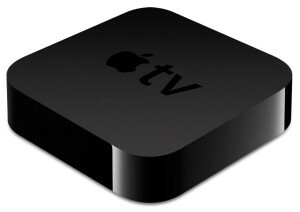 However in my opinion that is the one, and only one place the Apple TV is better than the Roku 3. The Roku 3 gives you a better channel selection, a more functional remote control, and more reliable performance… all for a lower price. If you are looking for alternatives to cable TV: Apple TV can play content from your media servers is the device for you but overall I just can’t recommend it and suggest you spend your money on a second Roku 3 instead.